Houston, 1943. Beulah Elizabeth Ainsworth Stevens Dillon on right with her daughter, Alice Joyce Stevens. Stevens, Beulah (wid. W.A.) waitress Modern Cafe, residence 17, 514 Buchanan. Stevens, Beulah (wid W.A.) waitress Modern Cafe, residence R, 526 W. Missouri. In 1935 Betty Stevens is listed in the Denver, Colorado City Directory as working at Ellsworth & Stevens, 244 Broadway. She was in partnership in a beauty parlor with Gene Ellsworth. 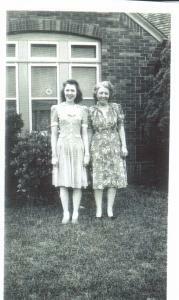 Gene married Bill Thompson later and stayed friends with the Stevens/ Arnott families until her death. Beulah Elizabeth Ainsworth married Charles Joseph Dillon circa 1938. In 1940, Beulah Stevens was listed in the Denver, Colorado City Directory as still working in the beauty parlor. Her address in Denver was 393 S. Downing. [S2] 1910 United States Census, population schedule, Stringer Village, Jasper County, Mississippi, page 351, family # 7.; digital image by subscription, The Generations Network (http://www.ancestry.com); from the National Archives microfilm. A printed copy is in the personal records of this researcher. [S49] City of El Paso, TX, City Directory (n.p. : n.pub., 1927, 1928). Hereinafter cited as City Directory, El Paso, TX. [S490] City Directory - Denver, Colorado (n.p. : n.pub., 1940). Hereinafter cited as Denver City Directory. [S7] Death Certificate, Texas Registrar's file number 6330. photocopy or digital copy is in the personal records of this researcher, Florence, Pinal County, Arizona. [S124] Personal knowledge of this researcher, Lynell Arnott (Florence, Arizona), from family connections and information from family member's direct knowledge of events. , This researcher was present at the burial.